If you’ve been paying a lot of attention to Danielle, Earl, and Fiona lately— no, you won’t find pics of them on TMZ.com—then a hurricane-tracking app, built specifically for your iPhone, iPod touch, or iPad, may help feed your curiosity about storms. A variety of inexpensive apps are available for both devices. Of the handful reviewed here, one is a universal app, and two have separate—but nearly identical—versions for the iPhone and the iPad. Despite significant differences in quality, the apps share a common limitation on the iPhone, which is simply that the screen is too small to get really good views of storm images. Hurricanes cut enormous swaths over both sea and land and can mosey along for a thousand miles or more before petering out—not easy to envision on an iPhone screen. The apps also share a common information source: the National Hurricane Center, which has an information-packed standard Website, which has also been optimized for mobile device. (It even includes radar-in-motion.) 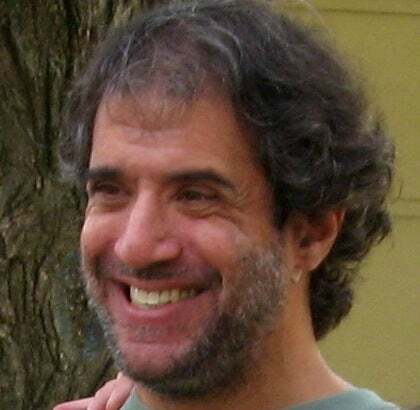 The site isn’t fancy, but it’s free. Eye on the Storm: Hurricane for the iPhone manages to overcome many of that device’s screen-size limitations with an excellent layout that provides crucial information on the home screen. If you’re looking for something a bit fancier, though, the winner of this small pack of apps is Hurricane HD for iPad, and its well-designed iPhone counterpart, Hurricane. The apps from Kitty Code are nearly identical. Each enables you to view maps and information in both landscape and portrait view. “Storm tracking,” which shows, with dozens of points on a map, the entire path of the hurricane from where it was first classified to its real or forecast endpoint, is exceptional. For any active storm, you can tap on a point, and a pop-up window appears indicating the hurricane’s wind speed and pressure. It does this throughout the storm’s path, which begins when it is first classified and ends as far as the forecast goes. If you enable location services on your iOS device, the app will even tell you how far you are from the hurricane’s eye. 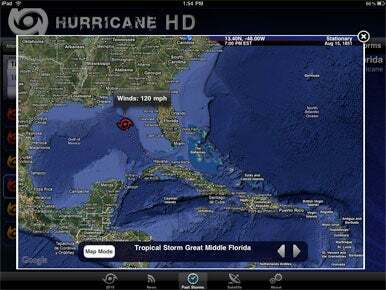 Hurricane HD’s home screen is easier to navigate and provides more information than the other apps reviewed here. It lists the active and completed storms of the year on the left-hand side of the screen; tapping on a storm’s name leads to an immediate display on the right of the storm’s latest position, speed and direction, pressure, and wind speed. Hurricane History: Hurricane HD sets itself atop the pack by providing a wealth of historical information. This is a display of the tracks of the Great Middle Florida storm of 1851. 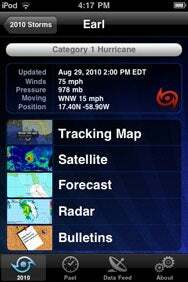 Hurricane HD also excels in both its graphics (smartly resized and easily scrollable in the iPhone version) and its historical data. It provides detailed information on storms dating back to the mid-19th century. Remember the Great Middle Florida category 3 hurricane of 1851? Surely not, but you can get the storm data—with storm tracks—on that one, and the four other unnamed storms of that year, as well. HurricaneSoftware.com’s iHurricane HD, a hybrid app for the iPhone and iPad from GenCode Systems, is also a very good app that enables you to follow current storms in a fashion similar to Hurricane and Hurricane HD, with superb images on both screens. This “free” version, however, comes at a price: users are urged, frequently it seems, to fork out $3 for an in-app purchase of the full version, which provides push notifications and, according to the pop-up ad, “more content.” It’s not clear what “more content” is, and the developers don’t say, either on the purchase screen or at the App Store. Double Trouble: iHurricane enables you to view multiple storm tracks simultaneously. 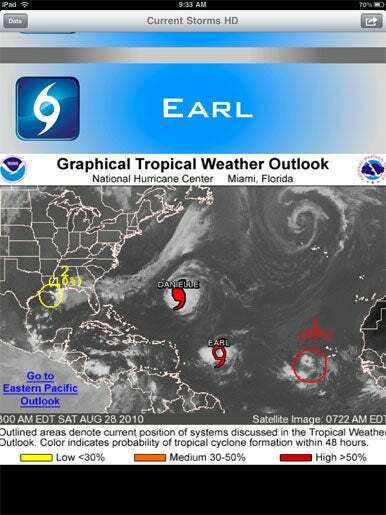 One of the hurricanes here is Danielle; the other is Earl. In any case, the paid version enables you to view multiple storm tracks simultaneously, a feature not provided by the other apps reviewed here. This can be useful and interesting during a busy hurricane season. But iHurricane lacks the wealth of historical data supplied by Hurricane and Hurricane HD. While push notifications cost money, e-mail notifications, are free, in a way. A prominent aspect of each notification is a link to the developer’s Website, where you can buy the Windows-only desktop program. In other words, iHurricane would be a lot more fun to use without so much iMarketing. Hurricane Tracker from Steve Parker is available in both iPhone and iPad offerings; each version costs $1 at the time this review was posted. If you want to save money, you can get the same material by visiting the Hurricane Tracker Website, which provides much of the same content. In other words, Hurricane Tracker is a Website in an app package. To its credit, the developer does have a menu in the upper-right-hand corner of the screen that includes as one option “Open in Safari,” which is the giveaway. But you don’t get to the menu until after you’ve bought the app, of course. Freely Available: Hurricane Tracker displays images and other data from the National Hurricane Center. It does little more to add value to this free information. iHurricane’s marketing tactics are merely annoying; Hurricane Tracker’s are … well, judge for yourself. When I used the “Open in Safari” menu option during my tests, the Website had this notice at the bottom of the home page: “The Next 5 Customers to review this app in iTunes for us will receive a $5 gift from us via PayPal as a THANK YOU. Email us ... To Claim! Hurry!” Hurry, indeed. The offer disappeared within hours. The five most recent reviews App Store reviews, which are laudatory, remain.